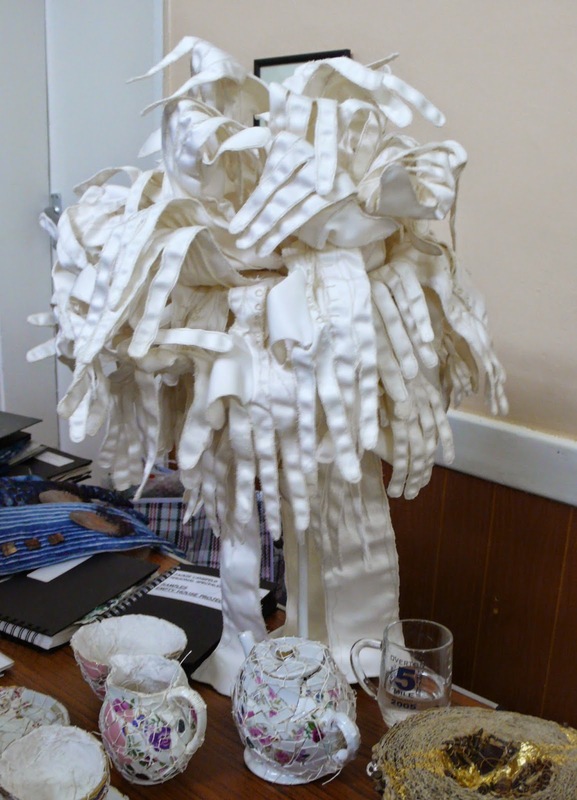 Jackie gave us a fascinating talk last Monday on her interest in using ordinary and mundane materials to create her very distinctive style of sculpture and stitch. Having worked in graphic design, she studied embroidery (City & Guilds) at Fareham College and then taught there for 12 years. She explained how she likes to use everyday materials to evoke emotions and memories. She has incorporated cloths, laundry marks, aprons and embroidered napkins in her work and told us how she is inspired by other artists, including Alice Kettle and Tracey Emin. She completed her degree in 2008 and was selected to display her work in the Graduate Showcase at the Knit and Stitch Shows. 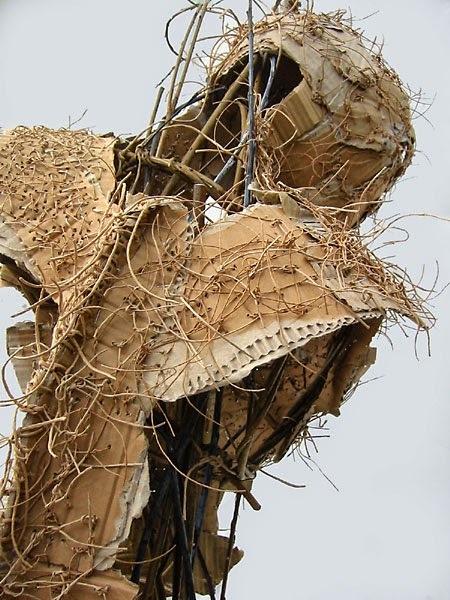 For her final degree project she created structures from willow and covered them with pieces of cardboard and heavily stitched with string and raffia. These sculptures evolved into figures, representing human frailty and man's short time on earth and were called Paper Warriors. More recently Jackie made 3 other figures (white angels) for Hyde 900 in Winchester Cathedral. 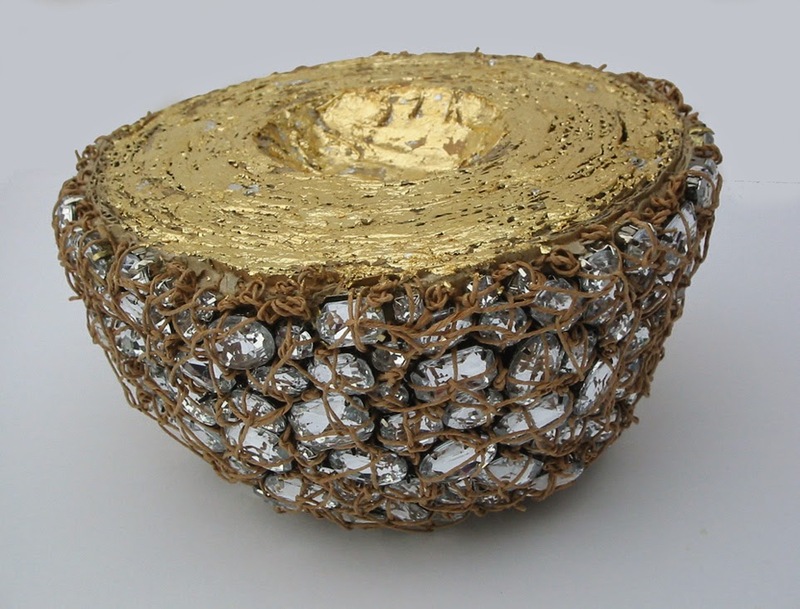 Jackie has made smaller items including Fool's Gold and Tea and Conversation. 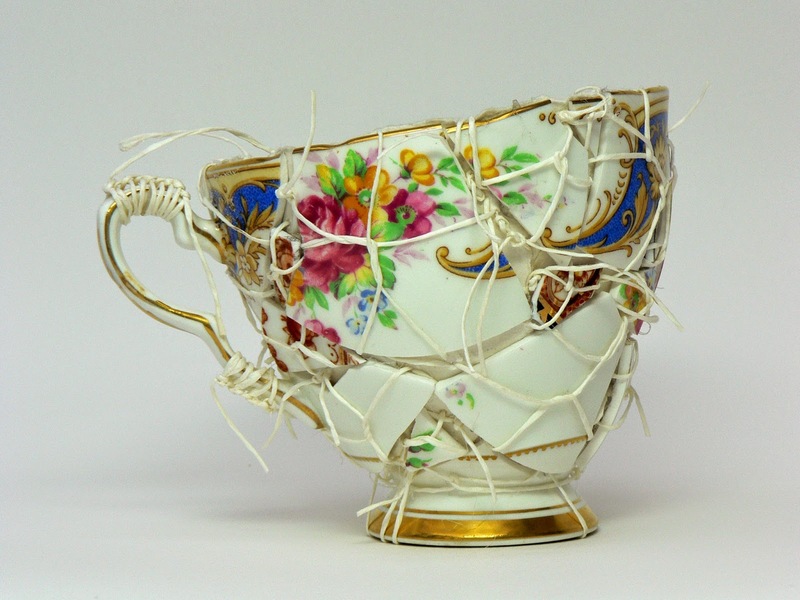 Jackie is an active member of the Prism group, who have an exhibition called Coded:Decoded, Unraveling the Message, at The Mall Galleries, The Mall, London SW1, from 27 - 31 May 2014. Thank you very much Jackie for coming to talk to us. It was fascinating, inspiring and certainly very unconventional!